We recommend wearing comfortable clothing and indoor shoes during workshop activities! Motivation and its mechanisms – How we motivate and demotivate ourselves. Relationship between motivation and performance. 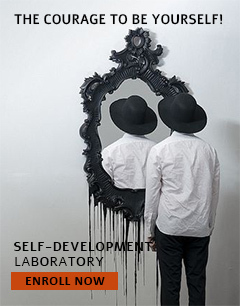 Fear of self-knowledge – Relationship with our own emotions, blockages, limits, qualities and defects. When qualities become defects. Perfectionism, mental rigidity and functional fixity – Relationship between automatisms, habits, divergent thinking, spontaneity, creativity. Emotions features and mechanisms – The role played by emotions in interpersonal relationships. Relationship between emotions and behaviors – How do emotions influence our reactions and behaviors; emotions and decisions. Personal vulnerabilities – Behaviors triggered by unmet needs and deficiencies. When the past excessively determines our present. The need for meaning – Integrating present activities into a coherent life philosophy. Future and quality of life perspective. If we have convinced you, enroll here in our personal development course!